Yesterday I received a rather big package and I was wondering what could be inside it. I opened it, and after going through some styrofoam chips and blister film, I found the Monatauk Gnat, currently the world lightest gas stove. And that is also my first, and only complaint: the excessive packaging for postage. The Gnat comes in its own very sturdy plastic case, so a normal, small package without styrofoam and blister film should be more then enough protection, and also makes shipping a lot cheaper - not to mention the benefits for the environment of less plastic going in the dumpster. 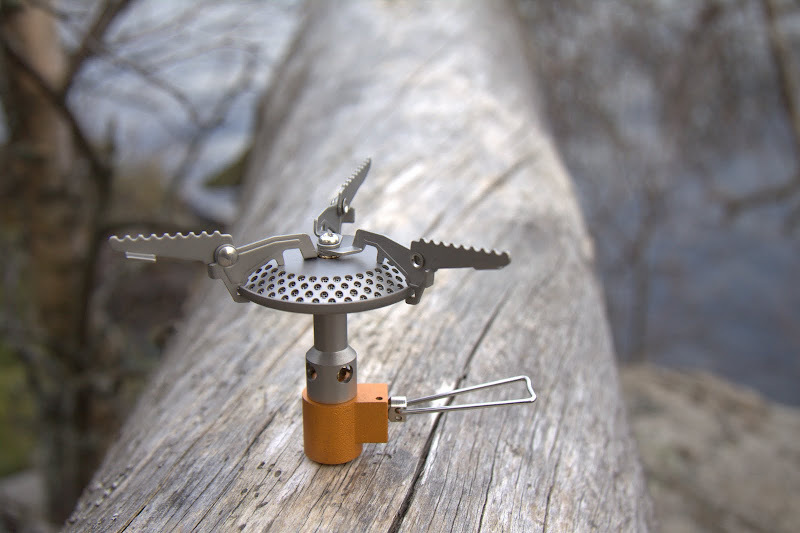 The world lightest stove - Monatauk Gnat. To watch in HD, click here and choose 720 p / HD. I'd like to pass the Gnat around to five different readers and have them test it. If you're a total newbie to gas stoves or a seasoned veteran, anyone can apply for a test of the Gnat. So how does this work? I send the Gnat to the first reader, and he gets to play around with it for two weeks. You need to have access to gas cartridges (I can't send those) and a fitting pot (something like a SnowPeak 600 cup or bigger) and you need to be willing to pay the postage to send it to the next person, but besides that it is completely free to you and allows you to test the stove without shelling out the money first. After your two weeks of playing you send the stove forward to the next in line, and drop me a short email about what you thought of the set, which will be published here on the blog. In that way we can collect different viewpoints on the Monatauk Gnat, see how it performs in different environments, and get a nice review together. You want to take part in the Passaround? Great! What you need to do is leave a comment underneath (preferrably not anonymous), and next week Tuesday (4th of May) around noon I will randomly pick the five people who get to test the Gnat. Because the Gnat is so light and tiny, this passaround will be open to the whole world - from Japan & Australia over the USA, Mexico & Argentina to Spain & Sweden (and everyone in between!). Before you hit the comment button, I'd like to remember you - you should be able to get a gas cartridge for the test in your town, have a suitable pot, you need to be willing to pay the shipping costs to the next person, and you're fine with sending me a short statement of your opinion with a photo or two. If that sounds like a good deal to you, please comment!